Posted by B. Daniel Blatt at 7:44 pm - August 31, 2012. A Jew could pay fewer higher compliments to another individual than to call him a mensch, meaning that he embodies the highest, the best qualities of a human being. The more we learn about Mitt Romney’s life since he married Ann the more we realize that the man is a mensch. Mitt Romney does seem to be a man of great empathy. No wonder Wisconsin Governor Scott Walker “would have preferred to see more testimonials from people talking about Romney” last night. Was Eastwood’s sketch designed to bait media and spook Democrats? Posted by B. Daniel Blatt at 7:30 pm - August 31, 2012. My friends who watched Clint Eastwood’s speech last night revealed in its irreverence and thought it was great. Some of my favorite pundits, however, wondered about the exercise, particularly scheduling it at a”vital” hour of the convention. Sara Murray of the Wall Street Journal reports that Eastwood’s (use of the) chair surprised the Romney camp: “Mitt Romney’s campaign staff did not realize that Clint Eastwoodwould be using that chair — at least not for something other than sitting.” But, I wonder. Judging an American icon like Clint Eastwood through a typical political lens doesn’t work. His ad-libbing was a break from all the political speeches, and the crowd enjoyed it. (H/t Ed Morrissey.) And “normal voters“, report the Washington Examiner’s Joel Gehrke, “like the Eastwood performance that pundits panned”. The crowd (and those “normal voters”) may have loved it — as did a number of my conservative friends who do not follow politics all that closely, but the Obama people really hated it. Last night Democratic National Committee Chairman Debbie Wasserman Schultz singled out the “sketch” for scorn in lieu of commenting on Romney’s strong speech. And it really seems to have gotten under Obama’s skin. “This“, quipped law professor William A. Jacobson “Is Not The Tweet Of A Confident Man of a message the president sent showing himself in a cabinet meeting (via Instapundit). Posted by B. Daniel Blatt at 6:45 pm - August 31, 2012. Filed under: 2008 Presidential Politics,2012 Presidential Election,Media Bias,Movies/Film & TV,Obama Worship & Indoctrination,Where's the Scrutiny? 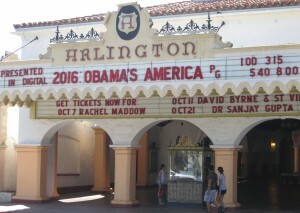 Seems an equal opportunity theater, going from showing a movie quite critical of Obama to hosting Obama apologists. The flick did do one thing which all too many in our legacy media have failed to do, inquire into Obama’a intellectual background, finding the individuals who and considering the ideas which influenced the future president. Folks in the media keep suggesting that we really don’t know much about Mitt Romney, but, well, we know a lot less about the incumbent President of the United States than we do about the man vying to replace him. And we knew even less about Barack Obama in 2008 when he, like Mr. Romney this week, was first nominated by a major political party for the highest office in the land. Posted by B. Daniel Blatt at 6:36 pm - August 31, 2012. Posted by Bruce Carroll at 1:00 pm - August 31, 2012. For those of you not in the Twitter world, you may have missed that I picked up a new companion on Wednesday in Tampa. Well, I’m on pain meds now and being driven home by the awesome Breeanne, Ben & Caleb Howe. I apologize to my readers for not being able to cover the RNC as planned. I hope to do a BlogTalkRadio show from the DNC next week. It all depends on how my new friend behaves. Posted by B. Daniel Blatt at 2:08 am - August 31, 2012. Sometimes when you don’t watch a speech, you can better learn how it played than when you do watch it. Of course you can’t reach your own conclusion about the address, but, in this case, the speech wasn’t going to sway me one way or the other in the presidential contest. Tonight’s speaker, Republican presidential nominee Mitt Romney is far superior to the failed incumbent. And I didn’t need a speech to remind me of his qualities. So, I chose to dined with good friends who, like me, are in Carpinteria for a myth conference instead of breaking our plans and tuning in. Those lines resonated and Mitt Romney successfully turned his rhetorical disadvantage into a leadership advantage. Unlike Obama, he won’t promise you the moon, he’ll get the job done. When we switched over to CNN, we caught Piers Morgan interviewing Democratic National Committee Chairman Debbie Wassterman Schultz, she chose not to challenge to the talk show host’s praise for the Republican nominee’s speech as “solid” (or did he say “strong”? ), but instead to make fun of Clint Eastwood’s dialogue with a chair. Seems a sign Democrats want to deflect attention away from the speech. Later, when we turned back to FoxNews, where former Howard Dean’s former campaign chairman Joe Trippi praised the speech. Seems it was a successful address.